The US Food & Drug Administration is playing a deadly game with the American people, a game that protects over-priced, oftentimes ineffective or inappropriate, and sometimes toxic or lethal drugs, while muzzling any evidence that there are cheaper, safer and more effective and appropriate non-prescription remedies. The FDA does not consider its mission to inform the American public of less problematic alternatives, even safer drugs within the same class, nor does it inform the public of natural remedies which have the same biological action as Rx drugs. In fact, any natural remedy that does in fact prevent, treat or cure a disease is declared a drug. The FDA arrogantly maintains prescription drugs are the high standard upon which all other remedies must be compared. The gold standard for an FDA-approved drug is the double-blind (doctors and patients don’t know who is taking active or inactive medicine), placebo-controlled, longitudinal (long-term) study. A drug need only beat placebo (inactive pill) to be approved. Some studies intentionally involve an overly large number of subjects in order to come up with the misleading conclusion that it is ever so slightly effective. An example would be statin cholesterol-lowering drugs that only avert a non-mortal heart attack in 1 of 71 high-risk subjects over a 5-year period of time. There is an even more remote chance statin drugs will save lives when used among healthy adults who have no risk factors for heart disease. Most statin drug users will derive no meaningful benefit because these drugs do not prevent mortal heart attacks. In the era prior to controlled studies, drugs like insulin, penicillin, aspirin, digitalis, sulfa drugs and many vaccines came into common use because it was obvious they worked in nearly all subjects. The same is true for vitamins. Except for those individuals with absorption or transport problems, vitamin C cured scurvy every time; vitamin D cured rickets nearly every time; thiamin (vitamin B1) cured beri beri every time; vitamin B12 cured pernicious anemia every time. By comparison, today’s FDA approved drugs may in fact be ineffective (statin drugs don’t prevent mortal heart attacks, cancer drugs don’t improve survival, antidepressants and drugs for Alzheimer’s disease are no better than a placebo pill) and may even increase the risk for death (examples: erythropoietin prescribed for cancer-induced anemia, anti-inflammatory drugs that may increase risk for cardiac death or from bleeding gastric ulcers). The logic of arguments used against dietary supplements is stupefying. While it is often said that dietary supplements are unproven, yet many FDA-approved drugs have already been disproven. Most antidepressants, anti-Alzheimer’s medications and anti-cancer drugs simply don’t work and should be removed from the marketplace. FDA-approved drugs have become such a farce. Consider there is not one blood pressure drug that addresses the primary cause of the disease. Diuretics reduce fluid load by increasing excretion of urine, beta blockers slow down the heart pump, ACE inhibitors calm a hormone produced in the kidneys, but the primary cause of age-related hypertension is stiffening of arteries due to calcifications combined with a shortage of nitric oxide, a transient gas that induces arteries to dilate (widen) with physical exertion or emotional stress. Just one magnesium pill a day will do as well as any single blood pressure pill. The production of nitric oxide is triggered by some nutrients, such as nitrites provided in extracts from beets, or by herbal extracts from pine bark or grapes (resveratrol, quercetin). Natural remedies more appropriately address the primary cause of high blood pressure than any existing FDA-approved drug, but they are shunned by modern medicine and classified as unproven remedies. Sometimes drugs do decrease mortality for disease but there are offsetting deaths when all causes of drug-related mortality are considered. Drugs can be approved (like anti-inflammatory drugs) which reduce an intended end-point (inflammation, pain) but increase the risk for death. The problem is that FDA-approved drugs are allowed to be widely advertised after gaining initial FDA approval before safety data obtained after longer-term use is analyzed. An unsafe and deadly drug may be on the market for years before it is recalled as the FDA relies upon pharmaceutical companies to monitor and tabulate their own safety data. The FDA has come up with a legal out for drugs that offer benefits while producing offsetting side effects. It is called the black-box warning label. This puts the legal onus on the prescriber. Yes, consumers can read these black-box warnings but often never consider them. By the FDA shifting the risk on the prescribing doctor it is more difficult to pursue legal remedies for avoidable harms that patients may incur. It becomes obvious here that the FDA is in the business of shielding pharmaceutical and vaccines makers, not the public. Consider vaccines where the public cannot by law sue manufacturers for damages from harmful side effects or deaths. Damage claims must be submitted to a vaccine injury board (officially the National Vaccine Injury Compensation Program). Since any significant pay out from this fund would be an admission that many vaccines, or least certain production lots of vaccines, are troublesome, the vaccine injury board makes it nearly impossible to receive pay outs on any claims. Again, the vaccine injury board exists to protect and limit liability of manufacturers, not to protect the public. Health authorities speak out of two sides of their mouth here. On one side it proclaims vaccines to be safe and the public should be vaccinated against all manner of disease, and on the other side it says there needs to be a vaccine injury claims board to “immunize” vaccine makers from liability claims. If vaccines are safe, then why would a special claims board be needed? In essence, vaccines represent “a little bit of disease” and are inherently problematic for children under the age of 2 years and seniors over the age of 70 who simply don’t adequately develop antibodies when exposed to pathogenic germs. These two groups represent the at-risk population for infectious disease mortality. In recent times American pharmaceutical companies have covertly hidden or deleted deaths or other side effects from their required safety data reports. Penalties for doing this are weak. Some companies are tardy by many years in reporting safety data on their products while deaths from their product mount. Intentional obfuscation of safety data is tantamount to hiding a murder. Fines do not adequately penalize. The profits are so large for some drugs (example: patentable cholesterol-lowering statin drugs sell for $3.00-$4.00 per pill while generic versions sell for ~10-cents), that drug companies can withstand lawsuits and other penalties by building these costs into the price of their products. America’s so-called ethical drug companies have become gangsters. In a reverse role, the mafia-like FDA is paid off in user fees and penalties as protection money for the crimes of these companies. Oh, a Congressional hearing or two pretends to take these criminals to task, then business as usual resumes. Anything short of placing drug company executives in jail will not put a halt to their crimes. However, a provision in the Dietary Supplement Health & Education Act (DSHEA) of 1994 states that dietary supplements can, in fact, make disease/cure claims for frank nutrient deficiency diseases, such as scurvy (vitamin C), rickets (vitamin D), beri beri (vitamin B1), or pernicious anemia (vitamin B12). However, the FDA effectively negates the freedom to make disease/cure claims for dietary deficiency diseases by clarifying this law on its own terms. 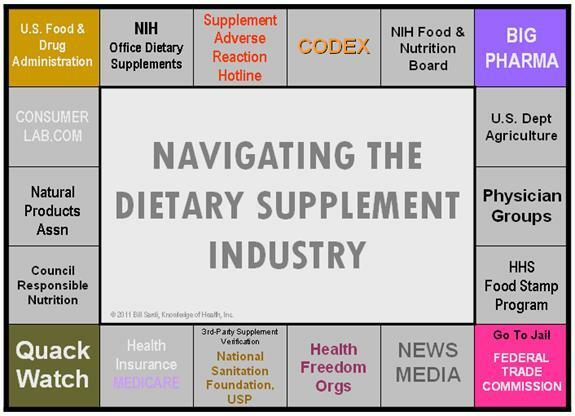 The FDA says any health claims that dietary supplements prevent, treat or cure disease have to be made in the context of what are called structure and function claims. That is, what structure or function in the body does a particular nutrient address? A dietary supplement manufacturer can’t really mention a disease, like scurvy, beri beri, pellagra or rickets, is “cured” by a dietary ingredient. The assumption here is that nutrients are like drugs and are intended to target a disease in a specific location of the body, like gastric ulcers or skin infections. Natural molecules have broad effects upon the entire body and defy such a narrow description. Structure/function claims may also describe a benefit related to a nutrient deficiency disease (like vitamin C and scurvy), as long as the statement also tells how widespread such a disease is in the United States. The manufacturer is responsible for ensuring the accuracy and truthfulness of these claims; they are not pre-approved by FDA but must be truthful and not misleading. If a dietary supplement label includes such a claim, it must state in a “disclaimer” that FDA has not evaluated the claim. The disclaimer must also state that the dietary supplement product is not intended to “diagnose, treat, cure or prevent any disease,” because only a drug can legally make such a claim. Of course, this is double talk. 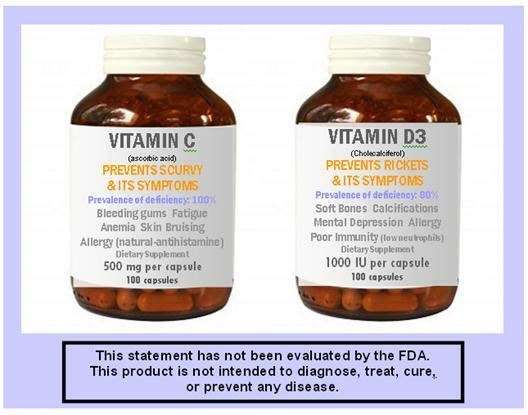 How can a vitamin C supplement make a claim it cures the common symptoms of scurvy (bleeding gums, eye hemorrhage, skin bruising, fatigue, anemia, irritability, weakened immune response) but not cure a disease? The disease is scurvy, the symptoms of scurvy are those described above. Furthermore, there is going to be argument with health authorities and the FDA over just what percentage of the population is deficient in a particular nutrient. If recognizing that humans experienced a gene mutation many generations ago that damaged the capacity of the liver to continually produce vitamin C internally, then all humans are deficient by that standard and few individuals except supplement users can adequately maintain healthy vitamin C blood levels. Vitamin B1: A strong percentage of the population are habitual consumers of alcoholic beverages or coffee or tea, which interfere with B1 absorption. It is highly likely that the majority of the American population experiences symptoms related to nutrient deficiencies that are never thought to be caused by shortages of essential vitamins and minerals. The public runs to doctors, gets a prescription drug and is oblivious to the fact their symptoms were caused by a nutrient imbalance. To make matters worse, the Food & Nutrition Board, part of the National Academy of Science, has dialed in a certain level of disease in the population by setting daily nutrient requirements too low. For example, the recommended daily requirement for vitamins C and D do not even measurably raise blood concentrations. The current recommended daily amount of vitamin D wouldn’t even cure rickets in an African American infant nor would it measurably raise blood levels in an adult. How many Americans are deficient in vitamin B1 (thiamin)? All alcohol drinkers are at risk since alcohol inhibits absorption of this essential vitamin. Chemicals in coffee and tea called tannins can also react with thiamine, converting it to a form that is difficult for the body to take in. The Recommended Daily Allowance, in this instance for thiamin, by definition is intended to prevent a nutrient deficiency disease for 98% of the population. Many millions of US adults regularly consume alcohol and are at risk. A standard vitamin B1 pill, generally providing 1-2 milligrams, may not prevent a shortage or overcome a state of deficiency. A fat-soluble form of this naturally water-soluble vitamin may even be needed enhance absorption and overcome common symptoms of deficiency (skin problems, chronic diarrhea and mental issues, coined as the 3Ds of B1 deficiency – dermatitis, diarrhea and dementia). The problem is, without a blood test, the public doesn’t know their symptoms are caused by a nutrient deficiency. Here is the dietary supplement label the FDA doesn’t want to see (below). Why? Because this label creates true competition with dietary supplements replacing drugs prescribed for the treatment of disease. Dietary supplements make a significant contribution to daily nutrient needs. Consumers are urged to carefully examine the level of scientific evidence (lab dish, animal, human studies) that substantiate whether a supplement prevents, treats or cures disease, and whether that science pertains to a particular product or its ingredients in general and provides the same dosage and form of nutrient used in a controlled study. How much nutrient-related disease is out there? God only knows how much nutrient deficiency disease is overlooked or misdiagnosed and inappropriately treated with drugs today. The average 75-year old American is over-medicated (taking 5 prescription drugs) despite the fact nutrient absorption and deficiency problems are rampant in this age group. The drugs themselves deplete essential nutrients yet the FDA does not require this fact to be included in product inserts. The public is left to their own self-guided use of dietary supplements knowing their doctors are poorly trained on the subject and that doctors typically roll their eyes when they hear their patients talk about vitamin pills. There isn’t a disease on the planet that cannot be aided by vitamins and mineral supplements, yet first-line treatment is drugs. A retiree can walk into a doctor’s office, present complaints about short-term memory loss, burning feet, fatigue and backache and received prescriptions for a number of drugs when all of these symptoms emanate from a single dietary deficiency – vitamin B12. Furthermore, a blood test that reveals vitamin B12 levels are within the normal reference range does not mean the patient has healthy B12 levels. The only way to conclusively know is to conduct a therapeutic challenge and provide supplemental B12 to see if symptoms subside. This author has received four inquiries in the past month about chronic diarrhea. Upon further questioning it was found that three of these diarrhea sufferers were regular beer drinkers and one regularly drank wine. Alcohol depletes vitamin B1 and induces chronic diarrhea. A short course of fat-soluble vitamin B1 resolved symptoms in all of these cases, but had these people gone to the doctor they would have likely been worked up with a battery of tests for irritable bowel syndrome and given a drug (lomotil) to slow down motility (passage) of waste material in the digestive tract, a drug that makes a person sleepy, may interfere with driving and produces other side effects. If the label on vitamin B1 pills were permitted to say “resolves symptoms of chronic diarrhea associated with overconsumption of alcohol” this could eliminate costly visits to the doctor and help consumers find a more appropriate therapy. Oh, doctors will protest, saying the patient may have other health problems that need a doctor’s attention, but the problem is doctors are inadequately trained to detect nutrient deficiency diseases. The patient will never get well on drugs. Another approach that has been suggested is to fortify alcoholic beverages with vitamin B1. However, this would eliminate a great deal of doctoring and inappropriate medical care, and furthermore, health authorities claim vitamin fortification would give license for over-imbibers to continue drinking. So we allow health problems emanating from alcohol-induced nutrient deficiencies to arise and then treat them as they occur rather than prevent them altogether. As an aside, alcohol also induces nutrient deficiencies for zinc and magnesium. I recall spending the days of my youth with periodic bleeding gums, green plaque on my teeth, fatigue and irritability, all signs of vitamin C deficiency. Not a word was uttered by my dentist about my need for more vitamin C.
In a drug-oriented health delivery and disease treatment system, just how will the many millions of Americans find their way out of symptoms caused by widespread nutrient deficiencies? The dietary supplement industry has withstood two prior attempts by the FDA to turn their products into drugs, one assault that led to the Senator Proxmire hearings in the 1970s and the 1994 attack that backfired and resulted in passage of the Dietary Supplement Health & Freedom Act of 1994. But now the FDA is ready to take the freedoms gained in 1994 away. The FDA, knowing that patents on many blockbuster prescription drugs are expiring and most newly approved drugs don’t work better than earlier off-patent drugs, and that so-called drug research and development pipelines are empty, is now ready to turn all dietary supplements into drugs by declaration they must submit to onerous safety testing or be removed from retail store shelves. Dietary supplements are poised to bring down the high cost of medicines, reduce avoidable side effects and improve the health of Americans, even reduce the overall mortality rate, but to do so there must be freedom to label supplements truthfully – that they do in fact prevent, treat and cure diseases, that their biological actions mimic or exceed those of prescription drugs and would improve measurable health parameters for most Americans at less cost. The FDA, in league with a Medicare prescription drug program that does not pay for dietary supplements (if Medicare did pay for supplements you can be sure they would only pay for watered-down doses of vitamins and minerals), and co-payments for medicines are far lower than the cost of supplements. Retirees on limited incomes are forced to use drugs to control age-related diseases rather than supplements, which are often more desired by Medicare enrollees. The public is being held at bay by a cabal involving drug manufacturers, physicians groups, health insurance funds and government research establishments. This is a form of government-involved racketeering, politically extending beyond crony capitalism to fascism, where industry owns government and exerts its influence under authority of law. Yes, but at what cost may we ask? With what assurance will natural products be prescribed rather than shelved? With what assurance that the public treasure chest won’t be gouged as it now is by overly-priced drugs, like 10-cent cholesterol-lowering statin pills that are billed to Medicare at $3.00-$4.00 per pill? The Medicare program faces a $60 trillion shortfall, so how can we continue to allow this crime to continue? With Congress in the hip pocket of the drug industry, who is there to launch a complaint to? It appears only an act of God is big enough to put a stop to all of this. The top-selling branded dietary supplement today, with over $1 billion in sales, is masquerading as a drug sold under the brand name Lovaza. This Rx fish oil concentrate is prescribed to lower a type of blood fat called triglycerides and sells for $240/month suggested retail price but only costs Medicare patients a $25 insurance copayment. An equivalent fish oil pill that IS a dietary supplement sells for around $130/month, but of course, insurance plans don’t pay for it. This is how the FDA, working in league with other self-interested parties, drives up the cost of healthcare. Legend, clockwise: FDA = government agency whose purpose is largely to promote drugs over dietary supplements; NIH = National Institutes of Health, Office of Dietary Supplements, which is now threatening to declare all supplements are drugs; Adverse Event Reporting Hotline = phone number to call if dietary supplements cause a serious side effect; CODEX = comprised of representatives from different countries for the purpose of “harmonizing” the dose of dietary supplements worldwide; Food & Nutrition Board = government-appointed committee that establishes daily nutrient needs for the population; Big Pharma = pharmaceutical industry ($883 billion in sales) that dwarfs sales of dietary supplements ($20 billion); US Dept Agriculture = plays peripheral role in making recommendations for nutrients in the population; Physician Groups (AMA) = physicians receive little training about dietary supplements but somehow know all the side effects posed by vitamin pills; Health & Human Services Food Stamp Program = which does not pay for dietary supplements for the group that is most needy in the population; Federal Trade Commission = sanctions and fines companies who make untruthful claims about their products; News Media = largely controlled by Big Pharma which sponsors most evening network TV news programs; Health Freedom Organizations (Citizens for Health, Natural Solutions Foundation, National Health Federation, etc) = groups that pretend to oppose restrictions on health freedoms and access to dietary supplements who tend to be alarmist and constantly seek donations; National Health Federation is only group that has standing at CODEX; National Sanitation Foundation, US Pharmacopeia = independent organizations that certify the quality of dietary supplements; Health insurance and Medicare = pools of insurance money that do not reimburse for dietary supplements because they are “unproven”; Quackwatch = anti-dietary supplement website that somehow has high ranking on the internet, declared two-time Nobel Prize winner Linus Pauling a health quack; Council for Responsible Nutrition = industry group that represents dietary supplement manufacturers; Natural Products Association = industry group that represents supplement makers and retail stores; Consumerlab.com = organization that is a shill for the FDA comprised of former FDA personnel who expose improperly labeled dietary supplements.